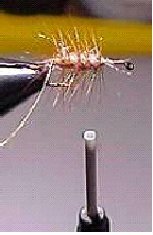 The elk hair caddis is one of the most used dry flies. 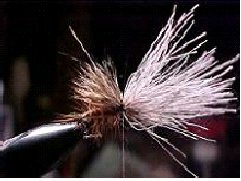 Caddis are found nearly everywhere in the world, and this pattern works. Hook: Mustad 94840, TMC 5210, Part. L2A Size 8-18 . Thread: Tan prewaxed 8/0, 6/0, or 3/0. 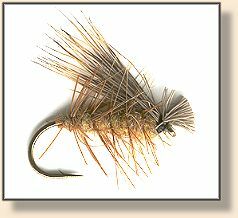 Hackle: Brown or furnace dry fly hackle palmered. Rib: Very fine gold or brass wire. Body: Yellow, Olive, or Natural Hares Ear fur dubbing. 1. 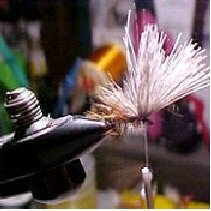 Tie in thread onto hook, and add a dry fly hackle at the front of the fly just back of the eye (an eyes length away from the front) make sure that the shiny side of hackle is pointing forward. 2. Wind thread back toward bend of hook, now you can add your rib securing it along the hook shank. Wind thread to back of hook shank to a point at the beginning of the bend. 3. 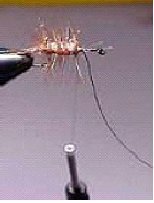 Add dubbing to thread (use either twist-on method or dubbing loop method) and dub on body of fly. Leave the thread at the point of the fly just behind the eye,(as previously discussed) do not return it to the back of the fly. 4. Wind hackle feather palmer style over the body back to the bend of the hook and use the wire to tie off the hackle feather by trapping it (winding the wire the opposite direction of which the hackle feather is wound) and wind the wire forward palmer style to the eye and tie off using the thread hanging there, being careful not to trap too many of the hackle fibers under the wire. 5. Secure a piece of Elk body hair and cut off about the size of a pencil diameter or just a little less and put into hair stacker (tips first) stack this hair and remove. Gauge the wing so that the tips of the elk hair will come back to just above the bend of the hook. Tie in the elk hair with a few wraps of thread around the hook and hair. You can of course take a wrap around the hair and then wrap it to the hook and wrap around the hair. Either way makes it secure. 6. Now hold up the front of the hair before you cut it off and take a few wraps under and up tight against the hair just behind the eye of the hook (wrapping the thread as as close to where the hair was wrapped down as possible). Now take your scissors and trim off the excess hair leaving a bunch of hair like a tassel on the front of the fly. This will form the head and should be even with the eye of the hook, (extended out to the front of the hook). 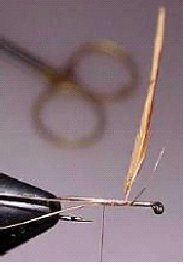 Do not trim the elk hair tight against the wraps of thread that you have placed there. Now whip finish the thread under the elk hair and then I like to take a few more wraps on top of the Elk hair and then whip finish there. 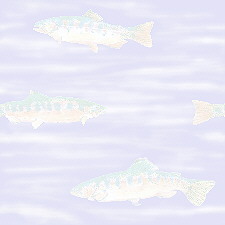 As a dry fly the traditional is 'upstream and dry' it works very well in fast water too. Remember to mend your line to get the best drag-free drift.